Passed away peacefully on the 9th April. Much loved husband of Mary. Father of Vanessa, Kristie, Adam and Stephen. Father-in-law of Chris, Daniel, Kristy and Kate. Poppy to Charlotte, Skyla, Max, Jessica, Billy, Georgia. Henry and Jonathan. 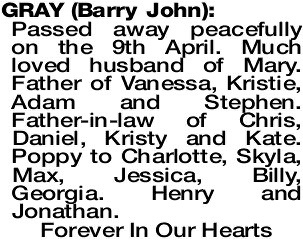 The Funeral Mass for Mr Barry John Gray of Secret Harbour will be celebrated in St Bernadette's Church, 5 Rennes Lane, Port Kennedy commencing at 10:30 AM on FRIDAY (12.04.2019). A Cremation will take place privately at a later time. GRAY BARRY Farewell to a good man and a good friend. Swimming with the dolphins at last. With love Marisa and Peter.